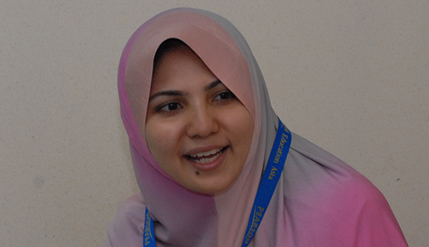 BANGI 16, Nov. 2010 – A UKM lecturer and clinical psychologist, Dr Safiyyah A. Aziz, is one of 20 people in Asia and Australia selected to receive the Australian Prime Minister’s Australia Asia Endeavour Awards 2011. The Aussie PM’s Australia Asia Postgraduate Award is a scholarship that provide full financial support for international student to undertake a postgraduate qualification at the PhD level by research in any field of study in Australia. It is for a maximum period of three and a half years. Dr Safiyyah will be doing her post-doctorate research in clinical psychology at the University of Western Australia from next January. The award is given to those who excelled academically and have experience in doing community service. Dr Safiyyah, who is one of the drafters of the Malaysian Child Act 2001, has been actively involved in doing social volunteer work here. Apart from coming first in both of her undergraduate and post graduate studies, she also works with sexually abused children giving her time generously to various safe homes that protect children. As a clinical psychologist she has been very active in dealing with a numerous abused children and children who are considered problematic. She is also a volunteer at ‘Rumah Solehah’, a center for children with HIV and Aids. She attributed her passion in volunteering and helping those in need to the very early training she received from her father. “Since I was 5, my father would bring me and my siblings to the children’s homes and other such places and we thus got involved in volunteer work,” Dr Safiyyah said. She would be focusing on young students’ language development for her PhD research. Basically it is about how children use their own speech to control their behavior. “Let say a child has behavioral problem like ADHD (Attention Deficit Hyperactivity Disorder) that have a very limited attention span. Basically its how they use their speech to control their behavior,” she said. Her research findings will enable parents and teachers to deal with children who are considered ‘problematic’ more effectively. Dr Safiyyah hopes to return home and continue serving UKM and the country after finishing her PhD. Her dream is to have an institute set up in UKM as a niche research area on children’s development. “Our children are the leaders of the future and we must find a way to make those who come from disadvantage families like broken homes, to excel in their life despite the shortcomings that life throws at them,” said Safiyyah.